The idea of ​​enhancing the free Slider utility appeared after the release of a lite version of the EA trade panel Trading Chaos Expert Lite, which operates in the Current Chart mode without the possibility to maintain trades of several symbols in a single window. Ease search for trading signals by automatic display of charts of currency pairs from the "Market Watch" one by one at a specified interval of time in seconds. Automation of one-click placing of pending orders using the script or Expert Advisor. Open a window with the chart of the required timeframe. Attach required indicators, a script or an Expert Advisor and create a template. Attach Slider profy to the template, setting up the required chart display duration and the Stop\Start button location corner. 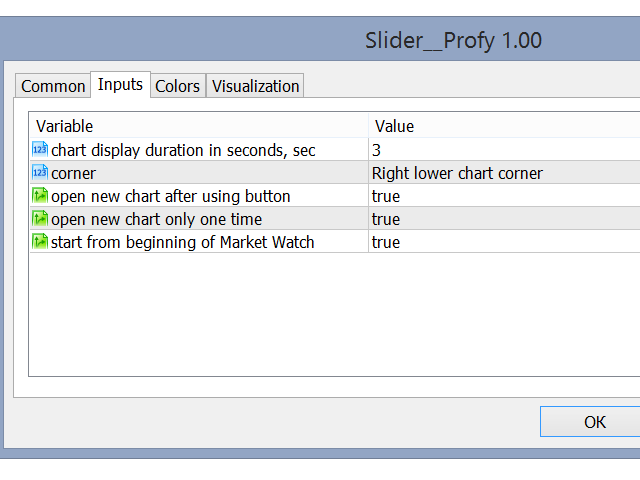 When you click Start, Slider profy starts showing chart one by one in one window, starting from the first currency pair in the Market Watch window. When a trade alert is detected, the Stop button is pressed. The Expert Advisor (script) is activated to enter into a position or place a pending order. Chart is selected using the left mouse button, Slider profy opens a new window with the template of the currency pair located next on the list in Market Watch. Press Start to view charts. After charts are viewed and market entries are automated, press the Window button in the МТ5 interface and select charts "Vertical" or "Horizontal". Thus the trader gets easy access to the charts with the running EA. The utility works with any indicators and Expert Advisors on any timeframe.